In Phil Schiller's keynote speech this morning, Apple announced a new version of the 17-inch MacBook Pro that features a long-life, non-removable battery, thinner profile, and an optional anti-glare screen. The laptop is less than an inch thick, and weighs 6.6 pounds. It features a 2.66 GHz Intel Core 2 Duo process, 6 MB of L2 cache, GeForce 9600M GT video card, and supports up to 8GB of memory. 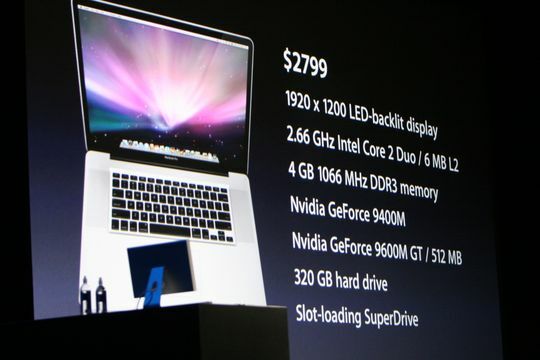 The default configuration with 4GB of memory and a 320GB hard disk ships for the same price as before: $2,799. The 17-inch MacBook Pro now features a non-removable battery with an estimated eight-hour life. The battery will also last for 1,000 cycles, according to the presentation. The battery is 40 percent larger than its predecessor, which allows for a greater charge and better life. The trade off, of course, is the fact that it's not user-replaceable. Apple is touting the new MacBook Pro as among its greenest line of laptops ever. The new battery for this model has three times the life of older MacBooks, lasting up to five years, which for many may be the life of the computer. It also earns an EPEAT Gold rating, and it contains no arsenic, BFR, mercury, and less PVC. TUAWNew 17-inch MacBook Pro unveiled with integrated battery originally appeared on The Unofficial Apple Weblog (TUAW) on Tue, 06 Jan 2009 14:00:00 EST. Please see our terms for use of feeds. January 6, 2009 by Ben Pike.